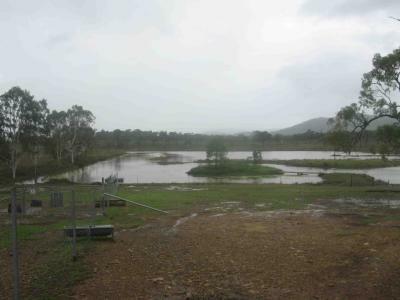 Our Dam after the Summer Rain! The Industry Standard is to give this monthly during wet/cloudy weather. In Southern States - this is during Winter. In Queensland - this is during our Wet Season in Summer. Some breeders like to give Vitamin D with Phosphorous - such as Coforta or CophosB, as it is thought that the D is absorbed better when given together, like when taking Calcium with Magnesium. If you find an animal limping, especially with shifting lameness from one leg / foot to another, examine for injury and if none found - this can be a symptom. Hairloss on the face, especially bridge of ears and nose or around feet - not caused by mites/lice or rain scald, this can be a symptom. Humped back, when not caused by injury or worm burden, can be a sign of Rickets. 1 x Recently Confirmed Pregnant Female: has a history of needing more D than other animals with hairloss around face. At this time we found her limping as well with no signs of injury. 1 x Tui Male that had surgery, presented with shifting lameness - the stress of the surgery has caused him to dump his stores and he is in need of more.